Gōng hé (工合) (Chinese, v.) / gɒŋ.χɜː / gong-hur. Lit. 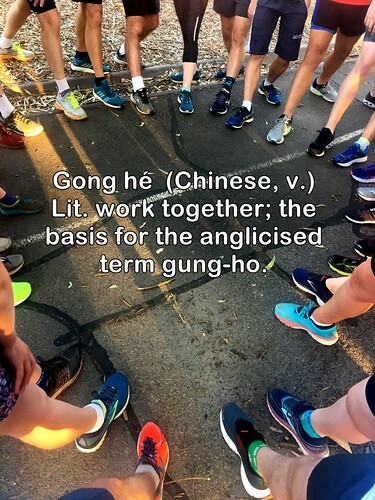 work together; the basis for the anglicised term gung-ho. Gōng hé” is a shortened version of the term “gōngyè hézuòshè” (工業合作社) or Chinese Industrial Cooperatives, which was abbreviated as Indusco in English. The two Chinese characters “gōng” and “hé” mean respectively “work” and “together”. This entry was posted in 2019, Inspirations and tagged #PositiveLexicography. Bookmark the permalink.